Once in a while, I get into these "I-want-to-eat-freshly-made-food" moods. I've baked my own croissants and Vietnamese baguettes for my upcoming cookbook, "Banh Mi: 75 Authentic and Delicious Vietnamese Sandwich Recipes", which by the way is already available for pre-order. In the past few months, I've also made pasta, ravioli, wonton dough and of course there's my usual ritual of making fruit preserves. 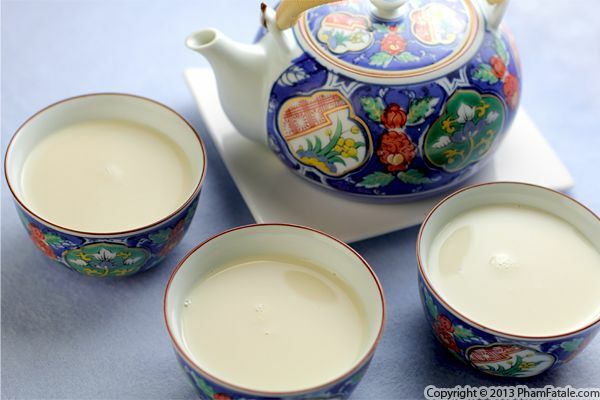 I realized I haven't made soymilk at home in a long time. This weekend, I got the girls involved and we made our own. The process is ultra easy even though it's labor intensive. But the result is well worth it. The amber color is slightly darker than the one you get at the store and the velvety, almost buttery texture is very satisfying. 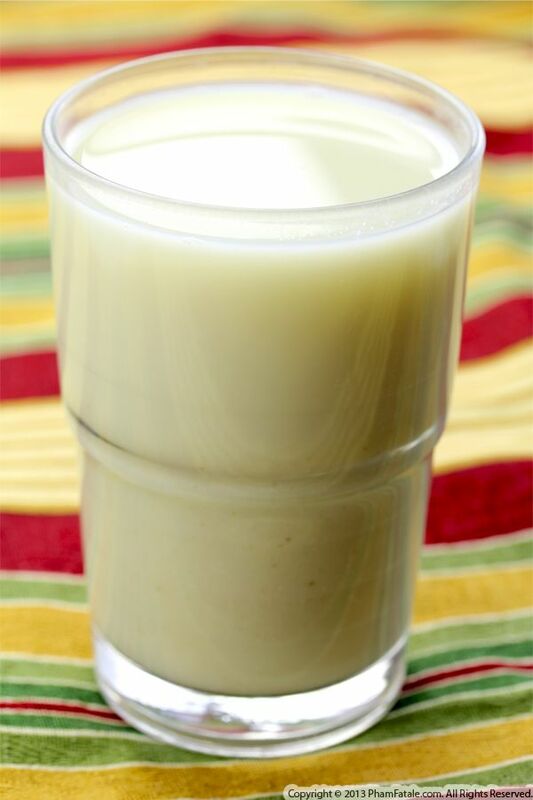 We made many gallons of freshly made soymilk and used much of it in other dishes. I'll share those recipes soon. This recipe is the result of one of my many experiments. The plants in our garden are starting to sprout beautifully. 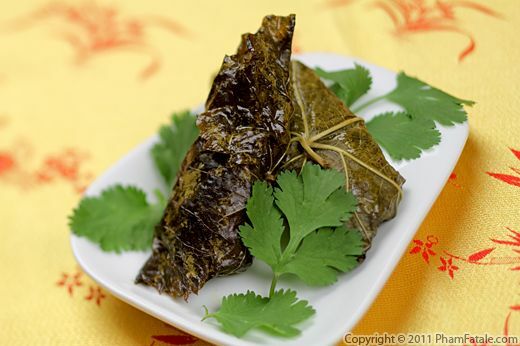 We have a small grape vine, so I used the leaves as wrappers for some Vietnamese vegetarian appetizers called tàu hũ cuốn lá nho (grape leaf wrapped tofu). 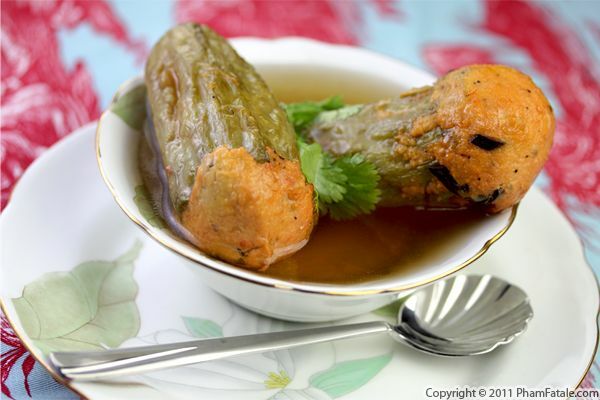 If you want to make the dish truly authentic, you should use betel leaves, but I find this version served on occasion. Betel leaves have a peppery, slightly bitter taste and I think the grape leaves taste a lot milder. The choice of the filling is really up to you. I filled them with bean thread noodles, fried jicama, shiitake mushrooms, fried tofu and fresh soy bean paste (packed with protein). Either way, they make the perfect snack or appetizers. They're healthy, tasty and packed with good nutrition. 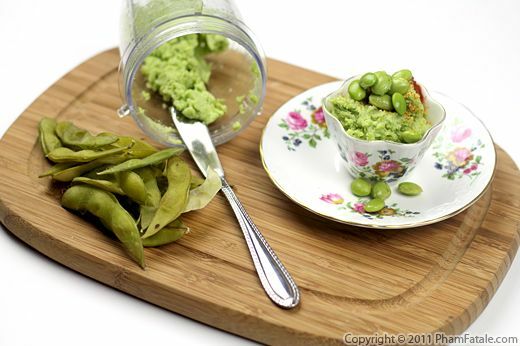 Edamame beans, also known as soybeans, are a common, healthy snack in our home. They're packed with fiber, protein and iron. So it's especially good because most of the family is vegetarian. To change things a little, I removed the thick velvety shells and made edamame hummus. The spread is made the same way I would make regular garbanzo hummus, except that I flavored it with feta cheese for a creamier texture. I left the edamame hummus on the table while preparing dinner. Everyone spread it on warm pieces of garlic bread. It's a great way to keep everyone patient while I’m getting dinner ready. If you're planning on serving it for a party, you could create crostini appetizers. They're always a hit!